Bipolar consists of drastic mood swings between mania and depression. This means that there are various different symptoms that come with bipolar disorder. There are also different types of bipolar to take into consideration. First of all, I think it would be beneficial to talk through the different ‘episodes’ associated with bipolar disorder, followed by a brief description of the different types of bipolar, the causes and the treatments available. When an individual experiences an episode of mania it can last for a week or longer and it can have a severe negative impact on their day-to-day life. In severe cases of mania, the individual may need to be hospitalised for treatment. Hypomania is very similar to mania however it does come with some key differences. If you were to experience Hypomania, it may feel more manageable in comparison to mania, meaning you may still feel as though you can go to work and school without encountering any major issues. The time in which Hypomania lasts for is also significantly less than mania and it does not come with psychotic symptoms. Some people may experience mixed episodes (also known as mixed states). This is when they feel depressed and manic at the same time or have rapid swings between the two. This can be very hard to cope with as the individual may struggle to understand how they are feeling and often do not know what kind of help that they need. It can also be difficult for friends, family and even doctors as it is hard to know what support the individual needs the most. In some cases, individuals will experience psychotic symptoms such as delusions and hallucinations. These can be very confusing for the individual, making it hard for them to determine what is real and what is fake. Bipolar 1: People are usually diagnosed with this type of bipolar if they have experienced at least one manic episode, which lasted longer than one week. They may only have manic episodes, however, most people with Bipolar 1 also experience periods of depression. If a manic episode goes untreated, it can last between 3-6 months, whereas depressive episodes can last between 6-12 months. Bipolar 2: This is when an individual experiences more than one episode of severe depression along with mild manic episodes (known as hypomania). Rapid Cycling Bipolar: This is where an individual experiences more than four mood swings in a 12 month period. 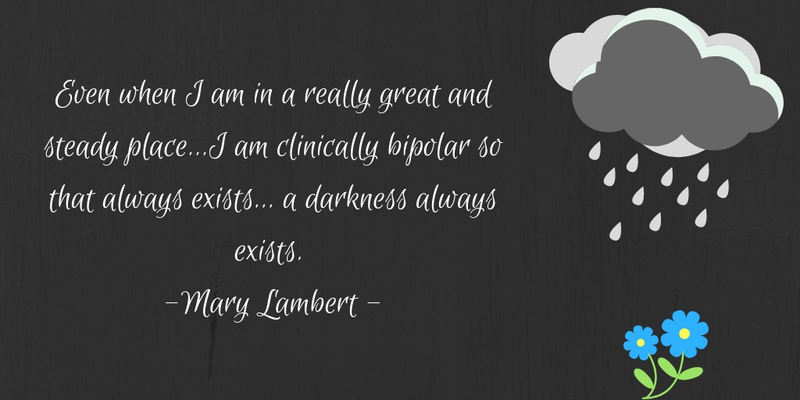 This affects 1 in 10 people with bipolar and can occur in both Bipolar 1 and 2. Cyclothymia: These mood swings are not as severe as those in full bipolar, but they can last much longer, and in time can develop into full bipolar. There is no definitive cause of bipolar disorder, although there is a range of factors which are believed to contribute towards its development. Chemical Imbalances in the Brain: We all have chemicals in our brains which are responsible for controlling our functioning, these are; neurotransmitters and include the likes of noradrenaline, serotonin, and dopamine. Evidence found that if an individual has an imbalance in one or more of these chemicals, they are at high risk of developing symptoms of bipolar disorder. Episodes of mania are more likely to occur when levels of noradrenaline are too high, whereas episodes of depression are more likely to occur is these levels are too low. Genetics: Evidence has found that conditions such as bipolar disorder seem to run in families. Therefore you are more likely to develop the condition if a close member of your family also has the condition (especially if that family member is a parent or sibling). There is no single gene is responsible for the bipolar disorder, there are a number of genetic and environmental factors can be seen as triggers. Triggers: Stressful circumstances or traumatic events can often trigger the symptoms of bipolar. This may include; breakdown of relationships, family issues, physical, sexual or emotional abuse, the death of a close family member or friend, physical illnesses, disturbances in sleep and overwhelming problems in daily life (such as financial problems, work or family problems). There is a range of different treatments available for people who suffer from bipolar disorder and it is important for them to find the best treatment that best suits their needs. Therefore, speaking with their GP and possibly a psychiatrist about their treatment plan is very important and very beneficial. There are various different medications available, which are designed to help with the symptoms of bipolar disorder. The most common medication for this condition is lithium. This is a mood stabiliser, however, it can be difficult to ensure that the right level of lithium is running through the individual’s body. For this reason, the individual will need regular blood tests for the first few weeks after being prescribed the medication, as if the levels of lithium are too low it will not do its job, but if they are too high it can become toxic. A couple of side effects from taking lithium are: being more thirsty than usual, gaining weight and passing urine more frequently. Another form of medication comes in the shape of anticonvulsants such as sodium valproate and lamotrigine (which are often used in treating epilepsy), these also help with controlling mood for individuals with bipolar disorder. It is important to have a conversation with your GP if you are pregnant or planning for a baby as valproate and lamotrigine can have negative side effects in this area. Some individuals may also benefit from taking anti-psychotic medication, which can help if the individual is experiencing hallucinations or delusions. Some medications in this area are Olanzapine and Quetiapine. Other than taking medication, talking therapies can also be very beneficial to people with bipolar disorder. The most common form of therapy used for treating bipolar (as well as other mental health conditions) is Cognitive Behavioural Therapy (CBT). This type of therapy specifically targets ‘thought errors’ and behaviours, helping the individuals to change the way that they think about things and helping them to see things from a more positive point of view. This may include helping them to look at a broader range of outcomes in regards to situations, rather than only seeing one negative outcome. This can help people with bipolar disorder, especially when they experience a depressive episode. Some individuals with bipolar catastrophise when they are feeling depressed, seeing everything in a negative light, in turn making them feel even more depressed. Using CBT can help to break these negative thought cycles. It is also very beneficial for individuals with bipolar to have a good peer support network. Being able to talk to other people in regards to their mental health condition can help them to feel less alone and more supported. They could decide to talk to a trusted family member or friend, or they may choose to attend group therapy sessions. There are also various family support sessions available to help the individuals family understand the condition of their loved ones and teach them ways in which they can help.